The New Generation of iPhone Battery Charger - Pack Light & Travel Light. As mini emergency portable battery charger, it's special designed for iPhone & iPod. Much smaller than others but powerful to add your iphone around 1 charge . 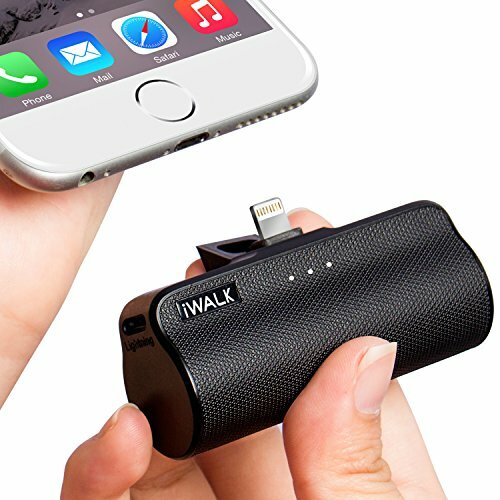 Forget the brick sized cell phone power bank for the short trip, Put this iphone battery charger in your pocket or handbag ealiely. - Just plug & charge, never bother with lightning cables again. - Recharging with lightning cable too , no need to get a extra micr-USB charging cable like others. 3300mAh capacity supply about 1.2 charges iPhone 7/ 6S or 0.8 charges iPhone 7 Plus / 6S Plus. Built in lightning cable connector, just plug & charge, never bother with lightning charging cable again. Power bank lightning input: Designed as iphone battery charger, not like regular power bank that is micro-USB input.